hardware specifications under the hood, an entirely new mobile payments platform and several new features. The refresh was not as groundbreaking as, say, the jump between the iPhone 3GS and iPhone 4, but less incremental than the iPhone 5 compared to the iPhone 5s. Ahead, we take a comprehensive look at the two new smartphones based on several categories: design, display, camera, battery, connectivity, payments, software, storage, colors, specifications and onwards. 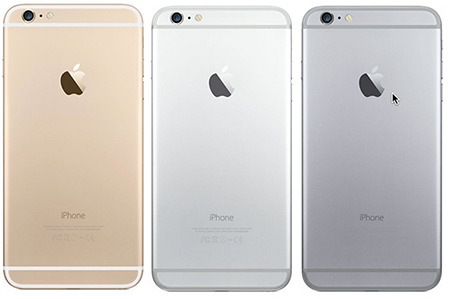 In a nutshell, the iPhone 6 is larger than its predecessor featuring an all-new design. 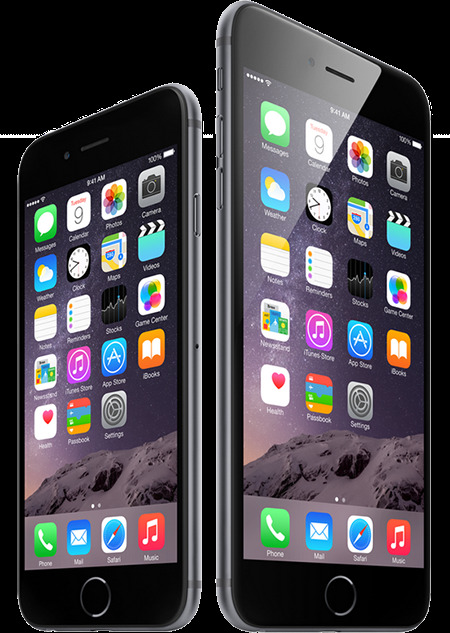 The standard iPhone 6 has a 4.7-inch display, while the iPhone 6 Plus packs a 5.5-inch screen. In terms of screen size, the iPhone can now compete head to head with Android-based smartphones that long ago eclipsed the 3.5-inch to 4-inch mark of the iPhone 5s and below. For those that have considered the iPhone to be too small, that is no longer a valid excuse. The new smartphones are also noticeably thinner, with the iPhone 6 measuring in at 6.9 mm and the iPhone 6 Plus a hairline bulkier at 7.1 mm. To achieve this design, which looks along the lines of a fifth-generation iPod touch, the iPhone 6 has a seamless transition between glass and metal like newer iPads, iMacs and other Apple products. The handset is made with a combination of anodized aluminum, stainless steel and glass. When Apple introduced the iPhone 4 in 2010, it was the first smartphone to feature a Retina display. That is the company’s fancy marketing term to describe any device with a high-resolution screen. Four years later, the iPhone 6 and iPhone 6 Plus have become the first smartphones to feature Retina HD displays. The difference: even higher resolutions. The standard 4.7-inch model has a resolution of 1,334 × 750 pixels, which is density of 326 PPI. Meanwhile, the larger 5.5-inch model becomes the first iPhone to be 1080p with a full 1,920 × 1,080 pixels resolution and 401 PPI. Both resolutions definitely raise the bar over the iPhone 5s, which measures at 1,136 × 640 pixels, but only catch up to the numerous 1080p screens that are available on Android-based smartphones and other competing devices. The all-new Retina HD Display packs a lot of innovation, including a full sRGB color standard, higher contrast and so-called incredible brightness and white balance. To achieve higher contrast, Apple developed an advanced process of photo alignment that involves using UV light to precisely position the display’s liquid crystals so they lay exactly where they should. The end result is a better viewing experience, with deeper blacks and sharper text. A wider viewing angle is the result of dual-domain pixels that enable color accuracy from corner to corner, and an improved polarizer provides you with a clearer view of your iPhone’s display when you’re wearing sunglasses. The four main components of a Retina HD Display, pictured from top to bottom in the image above, are the glass, polarizer, IPS display and backlight. Together, the hardware promises to provide the best viewing experience on iPhone to date. The Retina HD Display also has an innovative new feature called Display Zoom lets you choose between a standard view or zoom view depending on what you want to see. With a higher resolution screen, the ability to scale the Home screen or apps makes a lot of sense. Last, there is a Landscape view on iPhone 6 Plus that allows you to view the Home screen and several stock apps in a new dimension — just like an iPad in landscape orientation. A larger screen calls for a more powerful processor. The new Apple A8 chip features second-generation 64-bit desktop-class architecture and an advanced 20-nanometer process to deliver performance up to 50 times faster, and with up to 50 percent more energy efficiency, than the original iPhone. Accompanied by a new M8 motion coprocessor, graphics performance is also up to 84 times faster than the original iPhone. 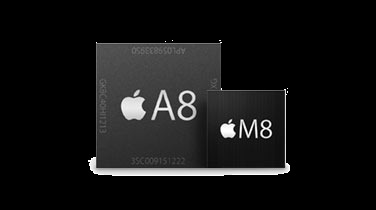 The A8 chip uses an advanced 20-nanometer process. It is 13% smaller, but delivers 25 percent improved performance with up to 50 percent more energy efficiency than the A7 chip, which powers iPhone 5s. The new iSight camera on iPhone 6 and iPhone 6 Plus, which is elaborated on in more detail in the next section, features an Apple-designed video encoder and image signal processor built into the A8 chip. This bring support for advanced camera and video features, like new Focus Pixels, better face detection, continuous autofocus, and enhanced noise reduction. Capturing and shooting higher-quality photos and videos should be easier. For an improved graphics performance, Apple has introduced a new technology called Metal that allows developers to create immersive, console-style games on iPhone. Metal is optimized to allow the CPU and GPU to work in unison to deliver graphics and complex visual effects, making the feeling of most games you play much more realistic. Based on the demo of Vainglory from Super Evil Games earlier this week, I am excited to see what else is possible. The world’s most popular camera is now even better with the iPhone 6 and iPhone 6 Plus, both of which feature an improved 8-megapixel iSight rear-facing camera that packs a long list of new features: focus pixels, face detection, exposure control, 1080p HD at 60 FPS and slo-mo video at 240 FPS, time-lapse videos, continuous autofocus, cinematic video stabilization and, exclusive to the iPhone 6 Plus, optical image stabilization. Focus Pixels: Focus pixels are enabled through Apple’s new image signal processor. These pixels provide the sensor with more information about your image, leading to better and faster autofocus that can even be seen in preview. Optical Image Stabilization: Apple has added optical image stabilization exclusively to the 5.5-inch iPhone 6 Plus that the company describes as working with the Apple A8 processor, gyroscope and M8 motion coprocessor to measure motion data and provide precise lens movement to compensate for hand shake in lower light. The fusion of long- and short-exposure images helps to reduce the subject motion, and a unique integration of hardware and software promises to deliver beautiful low-light photos. Face Detection: The new iSight camera has the ability to recognize faces faster and more accurately, including those far away in the distance or in a crowd. The result is better portrait and group shots, with improved blink and smile detection and a selection of faces in burst mode for capturing your best shots. Exposure Control: This feature enables you to lighten or darken a photo or video in the preview pane with a simple slide. You can go up to four f-stops in either direction. 1080p HD at 60 FPS and Slo-Mo Video at 240 FPS: When you shoot HD video on the iPhone 6, there is an option of recording at 60 frames per second. With faster frame rates, you can capture more action in each second and create sharper images that translate to more true-to-life video. Likewise, there is an option to shoot HD video at 120 fps or 240 fps in 720p in slow motion — full videos or parts. 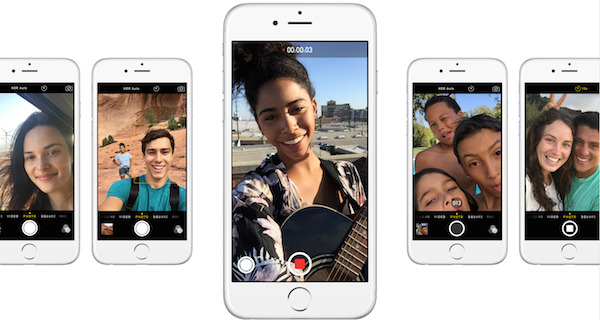 Time-Lapse Videos: iOS 8 enables iPhone users to create time-lapse videos that will snap photos at dynamically selected intervals. When they are stitched together, they create these still videos that have a very cool effect. Just set your iPhone where you want to shoot, and swipe to select the time-lapse mode. Tap the record button and film for 30 minutes or even 30 hours. Continuous Autofocus: The new iPhone 6 includes continuous autofocus in video, which is described as an advanced optical feature that makes use of Apple’s new Focus Pixels technology to ensure that shots remain sharp and stay that way while you’re recording — even if subjects or objects move. Faster autofocus means fewer inadvertent focus changes as well. Cinematic Video Stabilization: You are running down the street with your iPhone in your right hand, trying to record a video of something while you’re on the go. When you play it back later, the entire video is shaky because you were moving. That’s what cinematic video stabilization aims to fix, by keeping your shots steady and as smooth as gliding through the scene on a rig. Apple has also improved the front-facing FaceTime HD camera on the iPhone 6 and iPhone 6 Plus with a larger aperture and all-new sensor technology for capturing 81 percent more light. The front-facing camera also has improved face detection and an all-new burst mode for taking up to 10 photos per second. Additionally, the FaceTime HD camera features exposure control, improved HDR photos and video and a timer mode. While the iPhone 6 and iPhone 6 Plus have larger screens than their predecessors, battery life on the smartphones has not been impacted. In fact, Apple claims that battery life on the iPhone 6 and iPhone 6 Plus either matches or outperforms that of the iPhone 5s and below based on several categories: audio, HD video, Wi-Fi browsing, LTE browsing, 3G browsing, 3G talk and standby time. 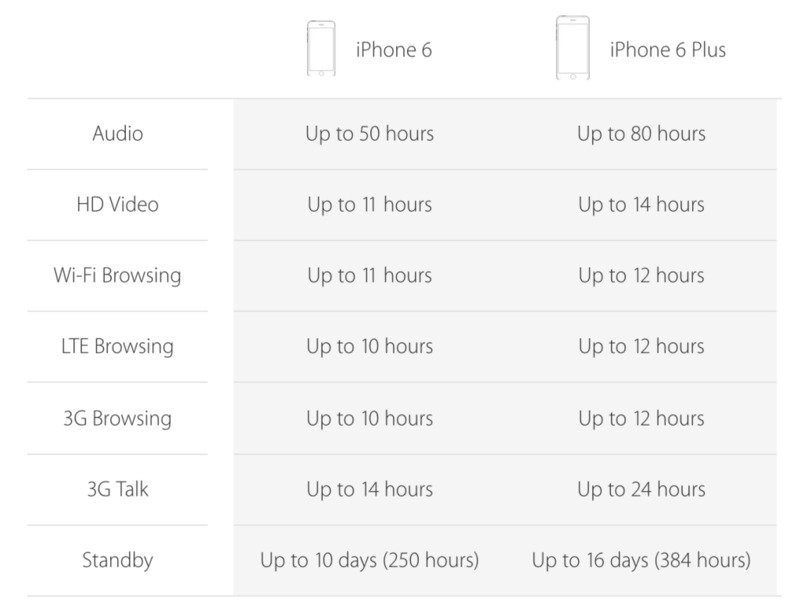 The chart below provides a side-by-side comparison of battery life on the iPhone 6 and iPhone 6 Plus. On a single charge, the iPhone 6 gets up to 50 hours of audio playback, up to 11 hours of HD video playback, up to 11 hours of Wi-Fi browsing, up to 10 hours of LTE browsing, up to 10 hours of 3G browsing, up to 14 hours of 3G talk and up to 10 days or 250 hours of standby time. Meanwhile, the iPhone 6 Plus has a larger battery capacity and, therefore, gets up to 80 hours of audio playback, up to 14 hours of HD video playback, up to 12 hours of Wi-Fi browsing, up to 12 hours of LTE browsing, up to 12 hours of 3G browsing, up to 24 hours of 3G talk and up to 16 days or 384 hours of standby time. The actual capacity of the lithium-ion batteries has not yet been confirmed. Early reports suggest that the iPhone 6 has a 1,810 mAh battery capacity and the iPhone 6 Plus has a 2,915 mAh battery capacity, although proper device teardowns will still have to be carried out before those numbers can be confirmed. Comparatively, the iPhone 5s has a 1,560 mAh battery that gets up to 40 hours of audio playback, up to 10 hours of video playback, up to 10 hours of Wi-Fi browsing, up to 10 hours of LTE browsing, up to 8 hours of 3G browsing and up to 250 hours standby time. 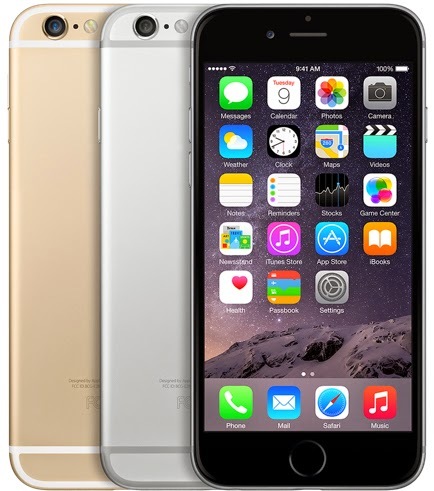 iPhone 6 and iPhone 6 Plus have improved wireless connectivity for faster LTE download speeds of up to 150 Mbps. Apple claims that iPhone 6 users can experience faster download and upload speeds for browsing the web, streaming music, making video calls and more. The smartphones also support Voice over LTE, or VoLTE, enabling wideband high-quality calls that are crisp and clear sounding. iPhone 6 has up to 20 LTE bands, more than any other smartphone and seven more than the iPhone 5s specifically. This allows the iPhone 6 to connect to more high-speed LTE networks in more areas, convenient for travelers that are data roaming or those that live in international countries. Plus, with simultaneous voice and LTE data, you can keep browsing on iPhone 6 while you are talking. 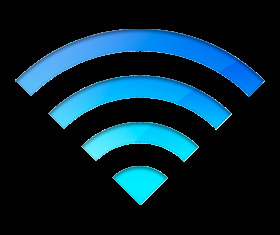 With new support for 802.11ac, there is also up to three times faster Wi-Fi on the iPhone 6 over the 802.11n technologies used on previous iPhones. A new feature allows you to initiate calls over Wi-Fi using your own phone number, and your call can seamlessly transition to VoLTE once you go out of range of your Wi-Fi connection. When you’re traveling between your house, car, work, airport or so forth, this feature is ideal. Apple Pay, the new mobile payments platform, is powered by the NFC chip on the iPhone 6 and iPhone 6 Plus. When you want to make a payment, simply hold your iPhone near the point-of-sale system and verify you are the card holder by scanning your thumb with Touch ID. The system stores your credit card info in an encrypted and secure fashion, with the help of Touch ID and the new A8 chip. 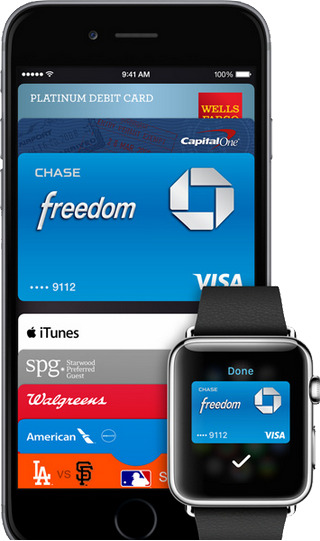 Apple Pay also supports the iPhone 5, iPhone 5c and iPhone 5s when paired with an Apple Watch. The service is deeply integrated with Passbook, enabling one-touch checkout with no card number entry, typing an address or signing a receipt required. Forget about carrying credit and debit cards in your wallet and simply use your iPhone for payments at over 220,000 participating stores in the United States. Apple Pay partners include Macy’s, McDonald’s, Bloomingdale’s, Whole Food Markets, Petco, Staples, Target and more, but notably absent are Best Buy and Walmart. Apple is expected to Apple Pay in October. iPhone 6 and iPhone 6 Plus are available in 16 GB, 64 GB and 128 GB storage capacities, with three colors to choose from: space gray, silver and gold. 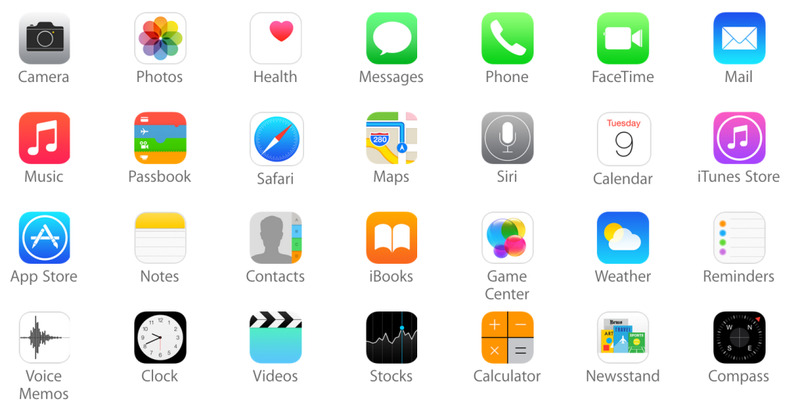 iPhone 6 and iPhone 6 Plus come with several built-in apps right out of the box, and Apple also offers a selection of free apps that can be downloaded through the App Store. iPhone 6 and iPhone 6 Plus pre-orders began on September 12th ahead of a public release on September 19th in the the United States, France, Hong Kong, Canada, Germany, Singapore, the United Kingdom, Australia and Japan. Apple plans to launch the smartphones in 115 countries by the end of this year. iPhone 6 and iPhone 6 Plus will launch in a second wave of countries on September 26th, including Switzerland, Italy, New Zealand, Sweden, Netherlands, Spain, Denmark, Ireland, Norway, Luxembourg, Russia, Austria, Turkey, Finland, Taiwan, Belgium, Portugal. The United Arab Emirates will begin selling the iPhone 6 on September 27th.